FIVE THINGS FRIDAY – March 18, 2016! What?! Friday? Ok, whatever, I’m on this. Have you been out celebrating St. Patrick’s Day? I wish I could be, but alas, there’s work to be done! Time to enjoy some FIVE THINGS FRIDAY! As you’ll see below, I got my first shipment from Thrive Market! I got these really tasty banana snacks and I gobbled them up for snacks and breakfast! Coconut Layer Cake — I don’t care what’s happening, cake is always good! Cumin Roasted Carrots from the Well Fed cookbook! I’m telling you, this cookbook is the jam! Perdue’s Perfect Portion Chicken Breasts — You can get plain chicken, Italian Style, Mesquite Grilled, etc. These are so simple to prepare, too! you can throw them on the grill, bake them, or shred them up! Look for them at your local grocery! Baked Almond Chicken Tenders | Treble in the Kitchen — I LOVE the flavor of these chicken tenders! The almond flour and spices create a great batter. Another staple recipe at my house. Haha, I’m dancing plenty right now. I’m hoping to get back to my workout schedule soon. Are You a Savings Addict? | Money.com — Ooooooh, savings addiction. This is slightly fascinating! Inside the fandom behind the runaway success of ‘Hamilton’ | The Kernel — YES. I’m so looking forward to (attempting to) win the ticket lottery when I’m there next month! Cross your fingers for me! 10 Things You Should Give Up To Be Happy | Meadow DeVor — Seriously. All of these. However, numbers 9 & 10 are speaking to me most these days. My first Thrive Market haul! 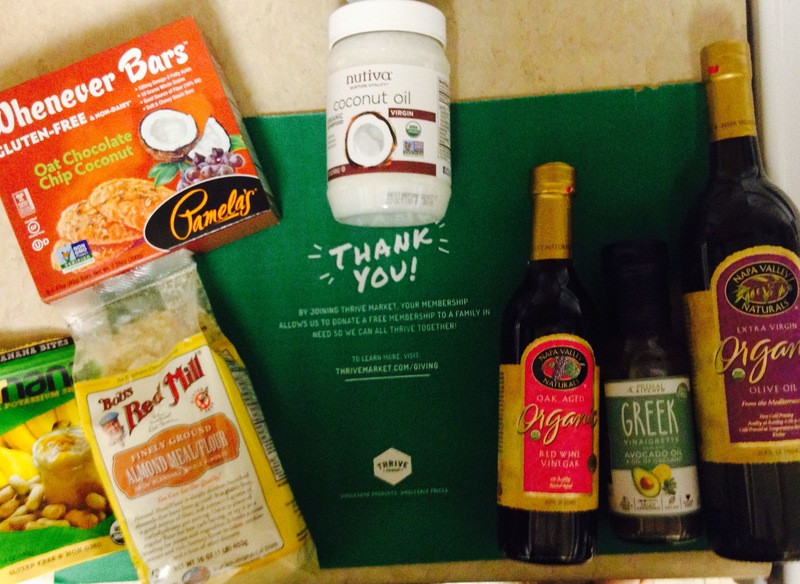 I got some seriously great deals on some pantry staples! That coconut oil was completely free, as was the salad dressing! I also killed those banana bites on the far left in two sittings – super tasty! Can’t wait to see what other goodies I will be getting from them in the future! Lots of new shows happening all around me in my community! Love them even more when I’m getting a discount or free tickets for tweeting and Facebook-ing about the shows! THE WEATHER HERE FINALLY BROKE 70 DEGREES! And it’s been repeating a few different days and I love it! Um, seeing this guy in concert two weeks agototally blew my mind and I’m still reeling from it! Broadgrass – mixing some of my favorite Broadway jams with some acoustic love. I still think it’s so awesome that he came close to my neck of the woods! GAH! It gave me LIFE! In the comments, tell me what is exciting to you on this Friday! Celebrating? Anything fun happening?